Saturday morning, I woke early and waited for the storm. Not really knowing what to do with all that waiting, I decided to bake. I was going to make cream biscuits but Lula who was awake as well wanted scones. 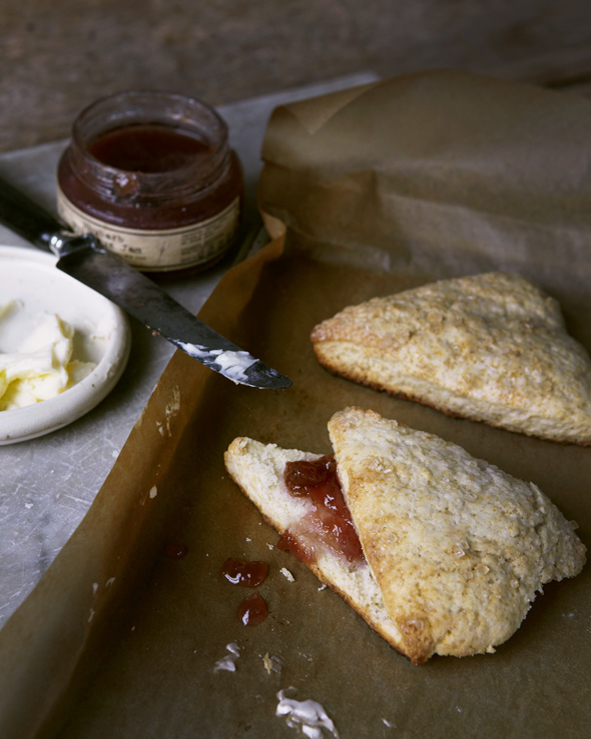 I used to have a great recipe for simple scones that friend had given me but I think it lives upstate on a very well used piece of paper tucked into some book somewhere. There was a time that I made them so often I didn't need the recipie anymore but now I seem to have forgotten the ratios. So... I turned once again to The Art Of Simple Food by Alice Waters. Page 275, right after the cream biscuits are scones, and they couldn't be simpler or easier! It only takes a few minutes to put the dough together and to pop them in the oven. I love to make jam but these days am so tempted by all the artisan jam makers. The jam I used with these scones is from the lovely girls at Anarchy in A Jar, it is Rhubarb Hibiscus. In fact they are so easy and quick, I decided to bring some to my shoot this morning... along with some lovage tea. Mix dough until it just starts to come together, it will be sticky. Turn it out onto a lightly floured surface and knead briefly, just enough to bring the dough together. Pat into an 8 inch circle. Brush with 2 tablepoons of melted butter and sprinkle with a bit of sugar. Cut the circle into 8 wedges and place the wedges 1 inch apart on a parchement lined baking sheet. Bake for 15 minutes or so or until golden brown. Substitute unbleached all purpose flour for the whole wheat. Use butter milk in place of the cream.